Welcome. Be our guest, be our guest! I’ve been crazy excited to show you this room. After moving into our home, we immediately had house guests so this room was a priority. I have continued to work on it over the last few weeks and was excited to partner with World Market on the final details of this space. I believe in creating a really welcoming place for guests so they feel comfortable and at home. 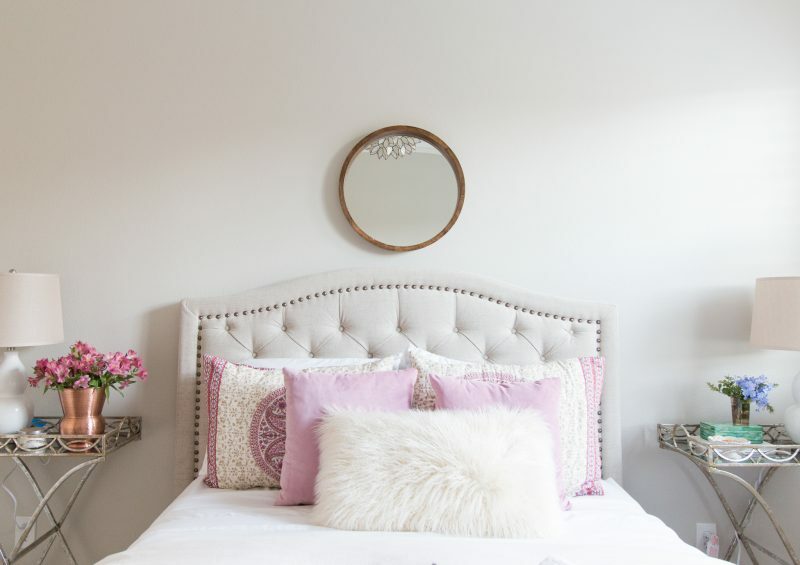 Little touches can make a space feel charming and luxurious while not costing a ton of money. 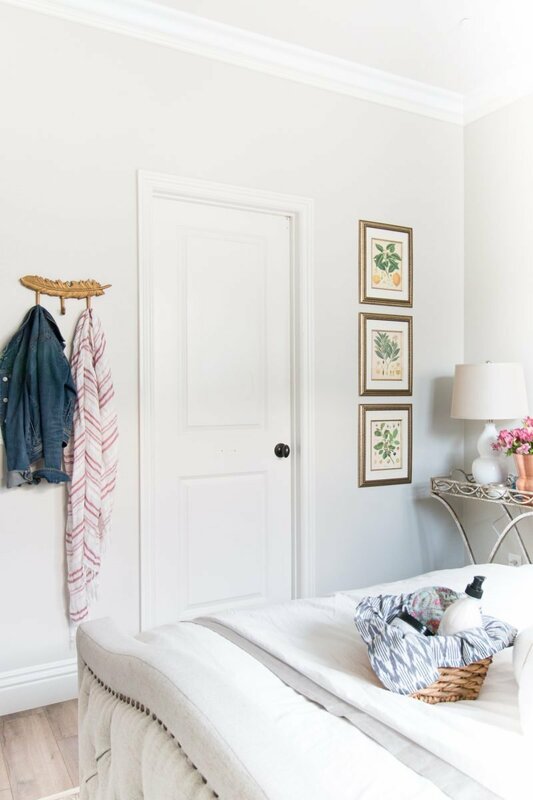 Here is our guest room reveal as well as tips for creating a welcoming space. 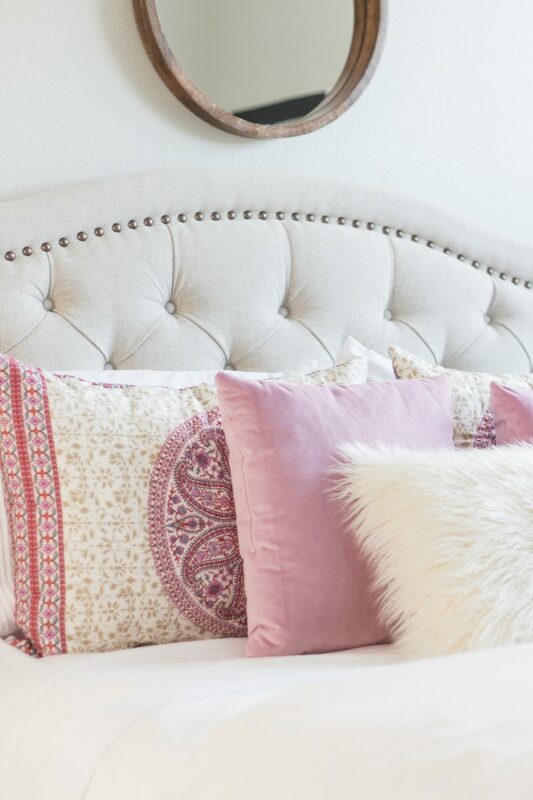 A guest room should be calming and peaceful. 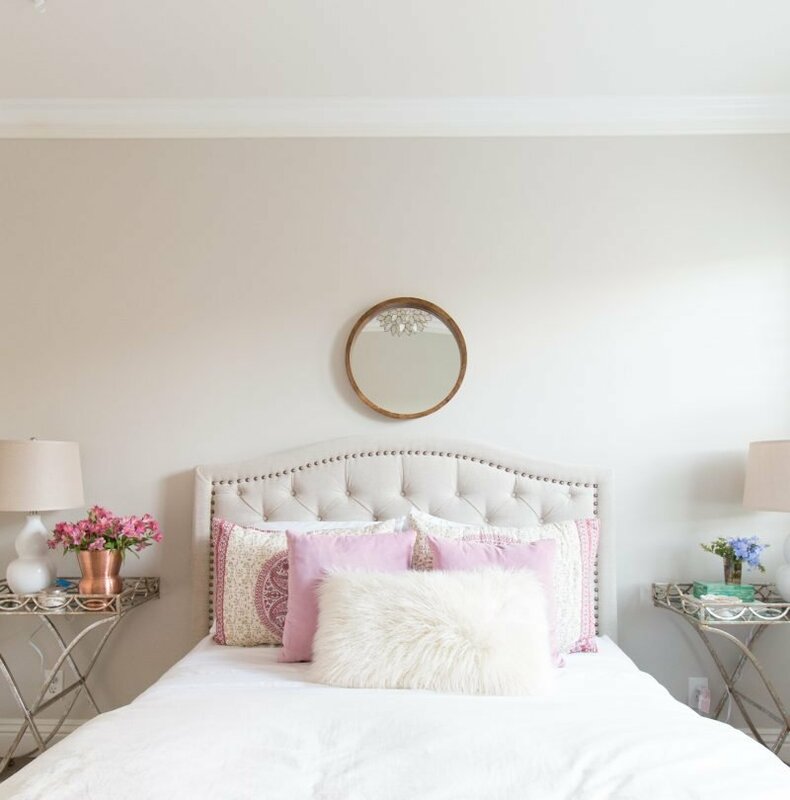 I don’t shy away from color, but I do think a neutral guest room (much like a luxurious hotel room) is appreciated by most. I kept the major pieces in the room, as well as the paint color, neutral. The paint color is Pale Oak by Benjamin Moore. We were able to reuse many pieces from our previous home which allowed us to save money. Can you shop your own home for things you could use? I decided to use this barcart on either side of the bed for a couple of reasons. The bed itself is quite solid and I knew dressers would look to heavy next to it. With an empty closet and a dresser at the foot of the bed, guests don’t need more drawers so I chose an option that added a bit of glam as well as a few curves. These even fold up! What?! The tray comes off and it could be used either for serving or on top of the bed to welcome guests with flowers and goodies. I appreciate the shimmer they add to this room and they are something you don’t see all the time. 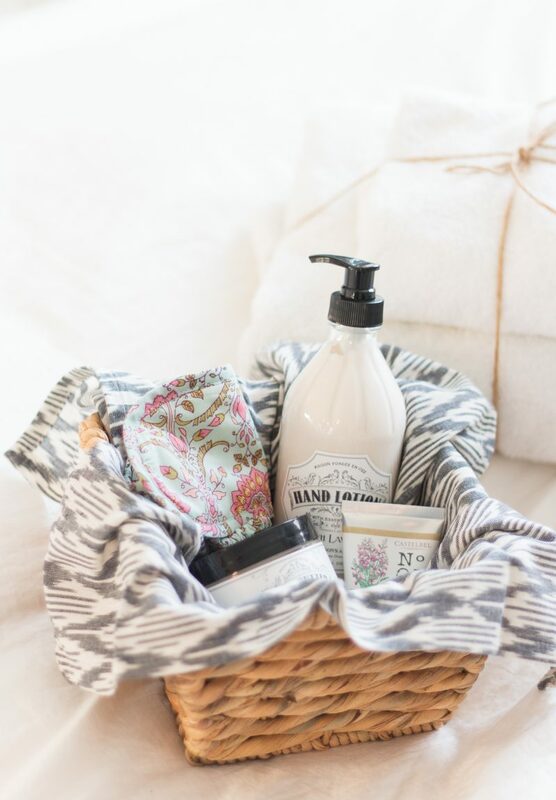 Does your guest have a favorite scent? 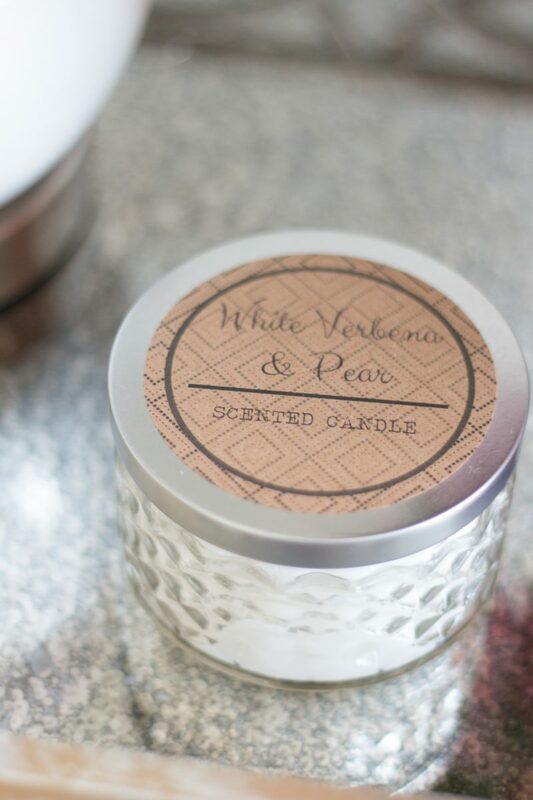 A candle or a lovely smelling lotion can make your guests feel welcome. I added this printed napkin (on sale) to the basket of goodies. It includes a sleep mask, lotions, and body butter. Although the overall look of this room is quite neutral, I think it’s always good to add in a dose of color. When it’s the last element you add, it often means it will be easy to change or switch up, too. 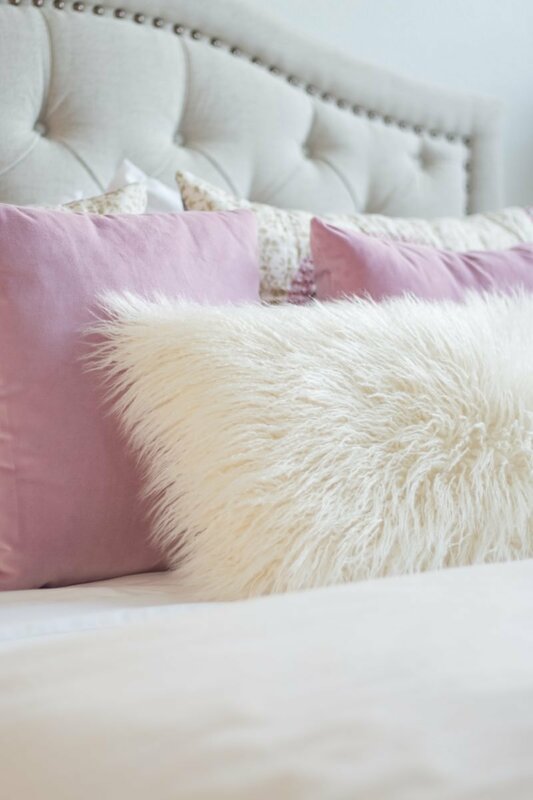 I am smitten with the Lilac Mist Velvet pillow and let it lead the way for adding color in this room. 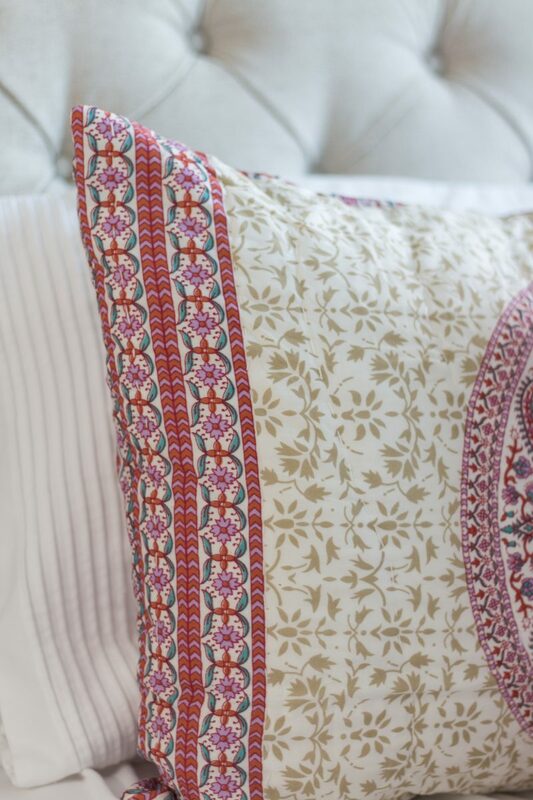 I am head over heels for the pattern and color of these shams. They add just enough color and pattern while allowing the room to stay neutral and calm. I can envision switching these out at Christmas time for some holiday pillows which would be fun. 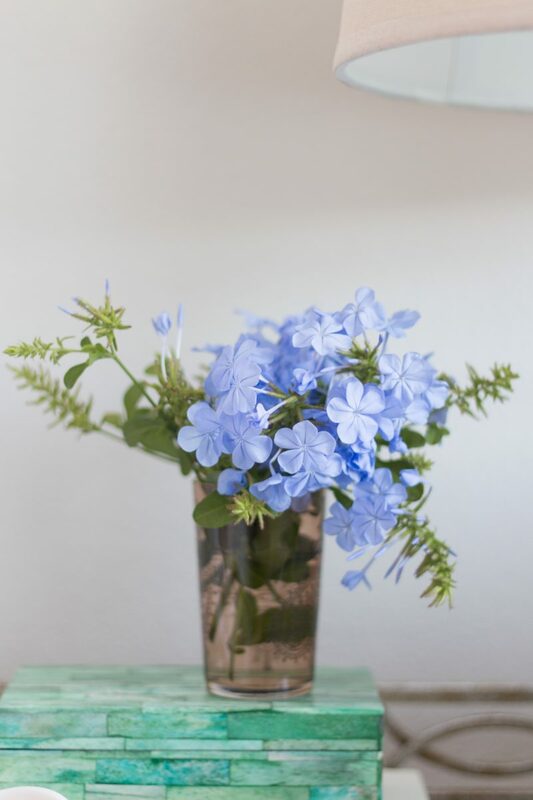 Flowers are the easiest way to make a room look luxurious. 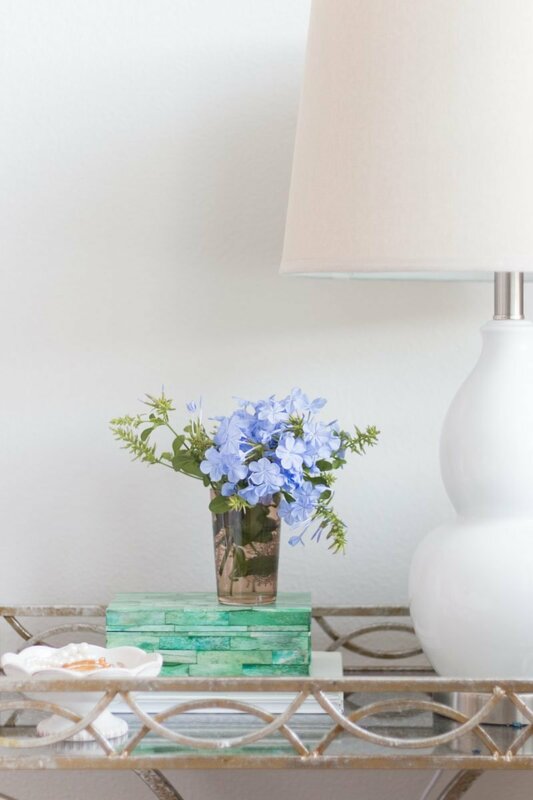 Thanks to places like Trader Joes, it’s easy to add inexpensive blooms to a space. This little tea glass is from the Nomad Tour and are perfect for clippings from the yard. 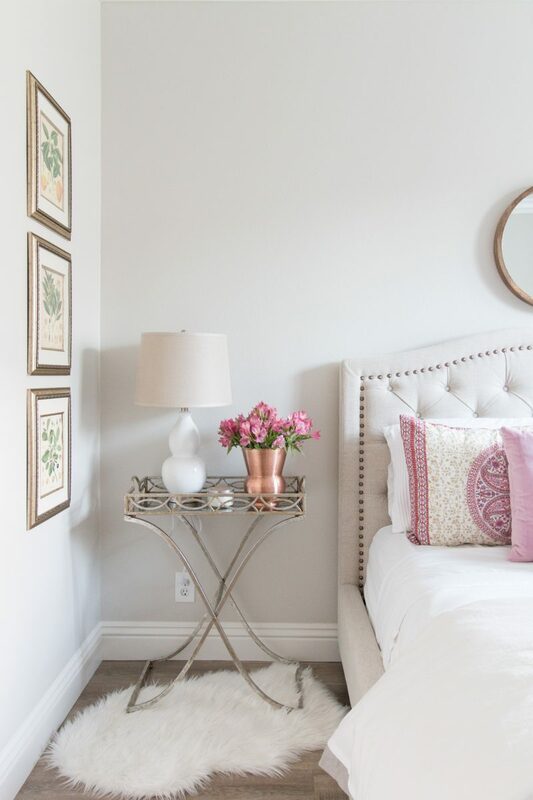 I love the copper vase seen below and the beauty it adds to the guest room. 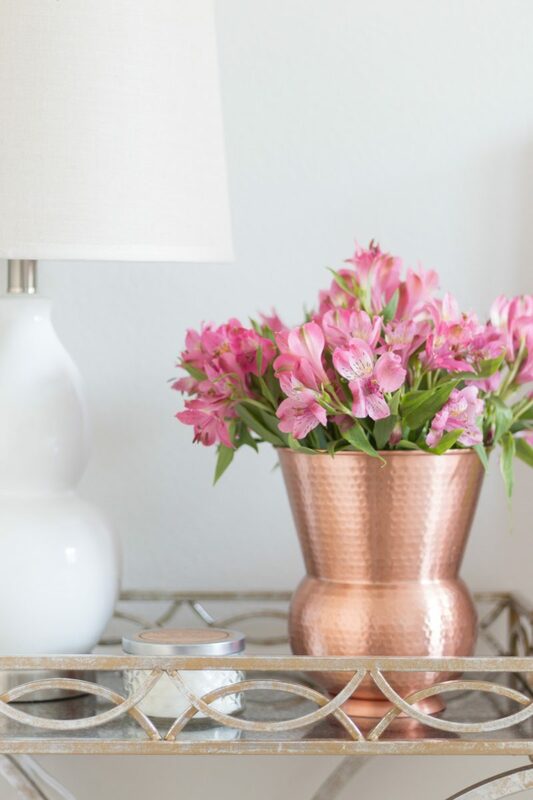 The copper piece is actually a utensil holder and would look gorgeous on a kitchen counter, too. Click on any image above to shop the details of this room. It’s always nice to think of what guests may need. They might like to hang a bathrobe, a jacket or a scarf. Maybe they would like a place to keep their handbag. A set of hooks makes it so much easier and allows them to keep things off of the bed or floor. This feather hook had me at hello. 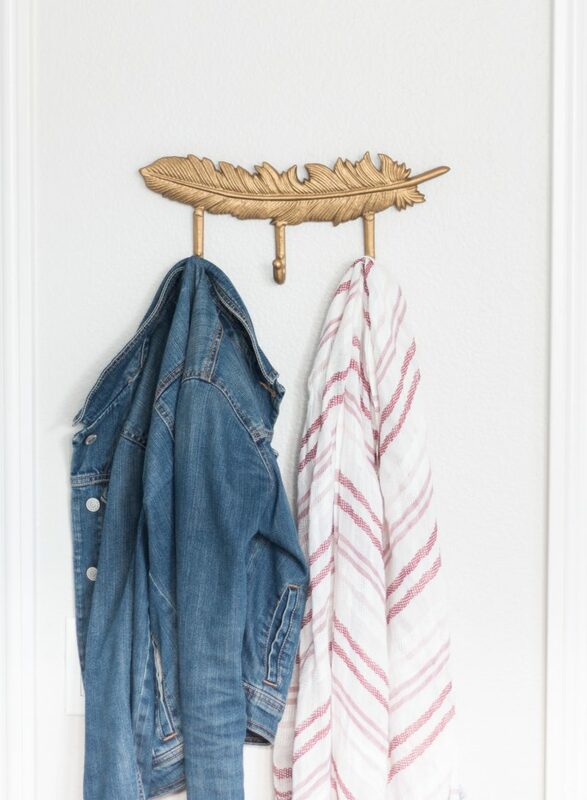 So sweet and a fun touch of brass to the room. Lighting is always a fun way to incorporate personality into a room. Do you have a light you can switch out for something fun and different? UPDATE: The light can no longer be hard wired. The only kit sold is a swag kit which needs to be plugged in. Disappointing and I will let you know if that changes. Don’t be afraid to mix finishes and textures. The pillows, the wood mirror, the metallic barcarts and the faux fur all work together to create a more interesting space. ONE || Chandelier: This pendant is a fun way to add unique charm. I like that it has a little bit of black detail on it which is picked up in the nailheads on the bed and the subway art on the wall. TWO || Shams: These are just straight up cute. I love the traditional, quilted vibe they bring to the room. I think it creates a cozy look. THREE || Velvet Pillows: These come in many colors and are an easy way to introduce a new color to a room. Here’s hoping we have many friends and family drop in so they can use this room. My daughter is first in line! She asked if she could stay in the guest room. I guess I will take that as a compliment. Fab room! Well done. It’s so soft and pretty. 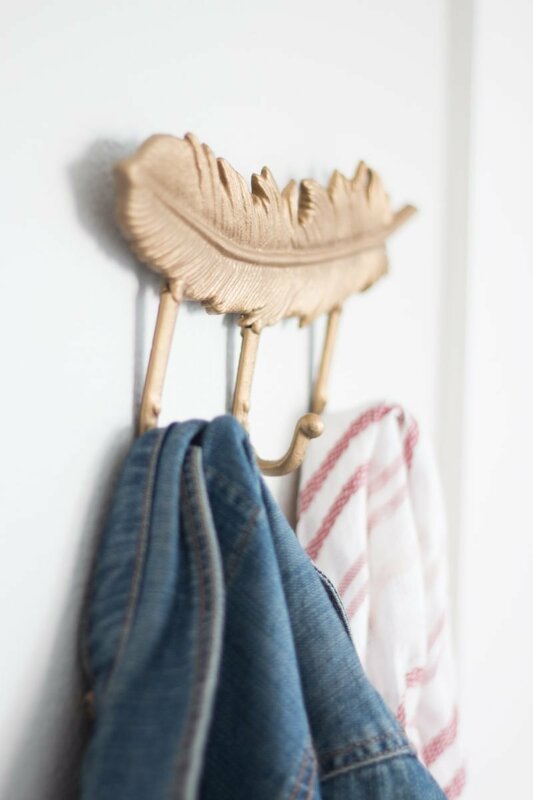 I like seeing how you’re repurposing items from your previous house too. It feels real. Let me know when Grandma Sue leaves. I’m coming over, too! Gosh…this room is just so, charming ! You have such fantastic taste, in everything you do, I have come to Find!! This room is absolutely Devine ! Absolutely stunning! Where are the three pictures from? Fabulous room. Love the idea of using bar carts as side tables. Really genius! Wow! Such a lovely room. May I ask where is the bed from? I checked Costco’s website and was not able to find the bed. Do you happen to know if it is still available? Thanks! Soo…when can I book my stay?? 😉 Gorgeous room!! It looks fantastic Courtney. I adore your style. The room is warm and inviting without being “overdone”. I think that is what I love best about the way you approach decorating your home. Simple, understated, yet so inviting. Very unique in blog land. You always stay true to yourself, and aren’t afraid to stray for the current trend. Well done!!! Looking forward to seeing more of your lovely home. Oh it is so pretty. Love the bedding and those pillows are wonderful. Beautifully done Courtney. It’s no secret that I also adore your style, home and fashion. Your guests will feel very loved, pampered and comfortable in this room! Such a calm and relaxing room. I’d love to come on over have those delicious meatballs then drift off into a blissful sleep???? Oh my GOSH! Just so pretty! Love your taste and you have made it gorgeous in a real way one could afford. Very pretty room, Courtney. Great tip about using the open bar carts to avoid a heavy look. I really love the bed. It is just what I’ve been looking for with the curved design. I’m not sure if I want a whole bed with attached footboard, however. I’ll keep looking. Beautiful room. Great job. Awesome styling. BM Pale Oak has become a favorite of mine also. Painted my living room that color this summer. I love this room! Would make me feel relaxed and at home. 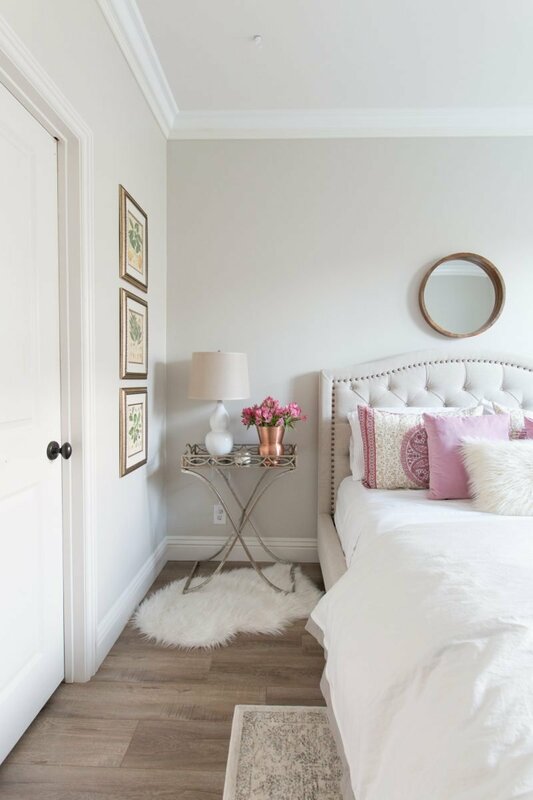 The color and overall design would be great for a teenage girl still in love with pink buy wanting a grown up room. I am looking for a dresser like the one you have. I was wondering if you had more info on it or had an idea where to find one. I have an upholstered bed in a small room but need the drawer space. Also, would you have any ideas for something similar to what you did for nightstands but that would provide a drawer for nightgowns? Thanks! I really like this space! I would love to be your guest in this space! 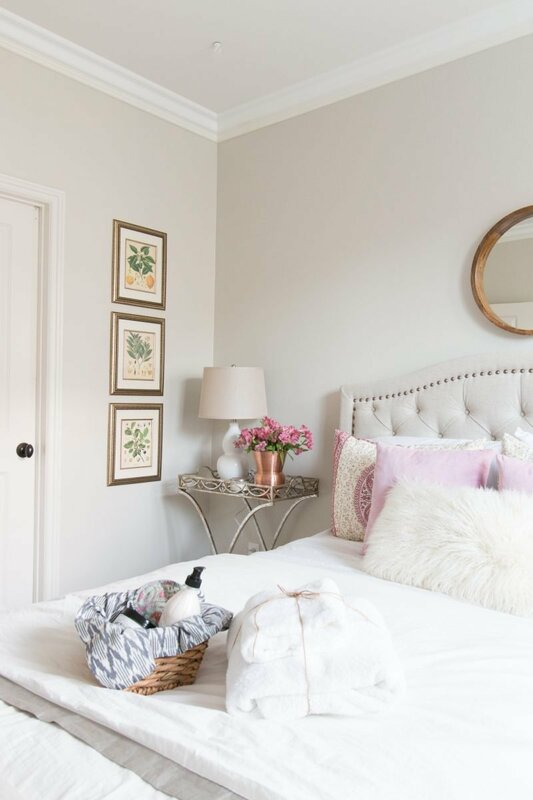 It looks so calming and relaxing, and I love the neutrals with subtle pops of color. Great job! So pretty!! I am always so inspired when I see your finished rooms. Great post! Really nicely done, and loved all the accessories! Thank you for sharing your home! It’s GORGEOUS! I would do that for our master in a heartbeat. So pretty . We’ve got a third bedroom but currently it exists only as a dumping grounds for my husband. Aye yi yi. In other news we did just re-do our front door and I LOVE it. Beautiful room! May I ask what color you painted the ceiling to go with the Pale Oak? Thank you! Hi Lisa. Thank you so much. We actually didn’t paint it. I do think the ceilings were painted in a color called White Shadow by the previous owners. I hope that helps. I love it! 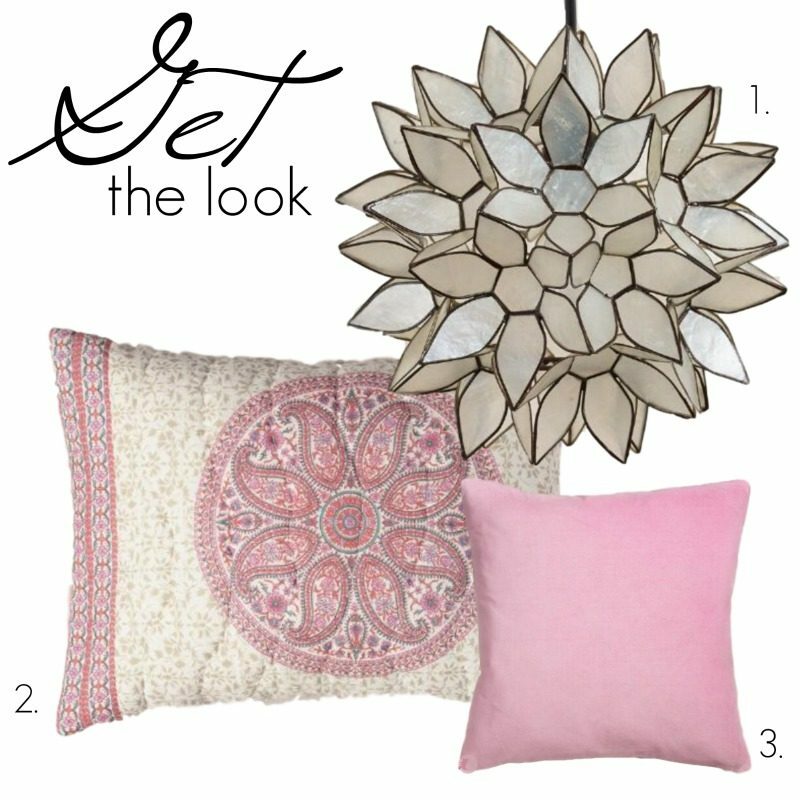 I really like how you used neutral colors with small touches of pink. My favorite are the pillow covers and the chandlier!! Found you on the Family Joys Linky. This room looks so restful – when can I check in? LOL:) Thank you for sharing with us at #OvertheMoon Link Party. Pinned and shared. Your guest room is beautiful! I love the little details you thought of to make your guests feel at home and enjoy their visit. So pretty. I have a guest bedroom to decorate. I will really use your tips. Thanks for sharing. I love the idea of using a unique side tables and adding hooks for guests. This is a timely read for me, I will be re-doing my guest room shortly. The first go around I painted it a bright color, I was thinking about go much lighter and you just sold me on neutrals. What great ideas and inspiration, love the furry pillow! I have been to the beaches for a vacation but was not able to visit through the community! Thank you for sharing on Oh My Heartise Girls Wonderful Wednesday last week and this week it is featured. I hope you will stop by and share another idea this week! So lovely! Thanks for sharing at the Inspiration Spotlight Party @DearCreatives Pinned & shared. What a beautiful room! Can you tell me the name of your flooring? Beautiful room!! What kind of flooring did you use in there?! Hi Courtney I loved following you!! I love your home and all your inspirational ideas. I want to start blogging. Any ideas or suggestions on what you learned or who you went with to start your website. Hi Courtney. I’m looking into similar tufted beds, but the overall height of many seem so low. Can you tell me the height of the headboard? Beautiful room! What white color is the trim ? Looks great with pale oak. Hello, your guest room is simply divine. I woul like to have a similar look on my bedroom. Can you tell me anything about the flooring? So grateful if you can steer me in the right direction! I have a guest bedroom that looks very similar and can’t figure out what rugs to put down. Where did you get the one that is in your room? I guess it goes without saying that I really like your guest room, too.